LEAKED-MMS_Malaria_Cure_Documented_by_Red_Cross_(Titled-Because_We_Can)_Dec_2012.zip ZIP 1280x720 203MB Same as above, but stored in a zip archive. Just click to download. LEAKED-MMS_Malaria_Cure_Documented_by_Red_Cross_(Titled-Because_We_Can)_Dec_2012.wmv WMV 320x240 6.9MB Same as above, but small enough to email. Youtube_Title_and_Description_(Long_Version)_V014.docx DOCX N/A 17KB Original Youtube description editing file containing more information than fits in the Youtube description field. Can be used on websites embedding the above videos. Note the time tags are correct for the ANNOTATED VERSION of the video only. Maybe be updated. Note version numbers. 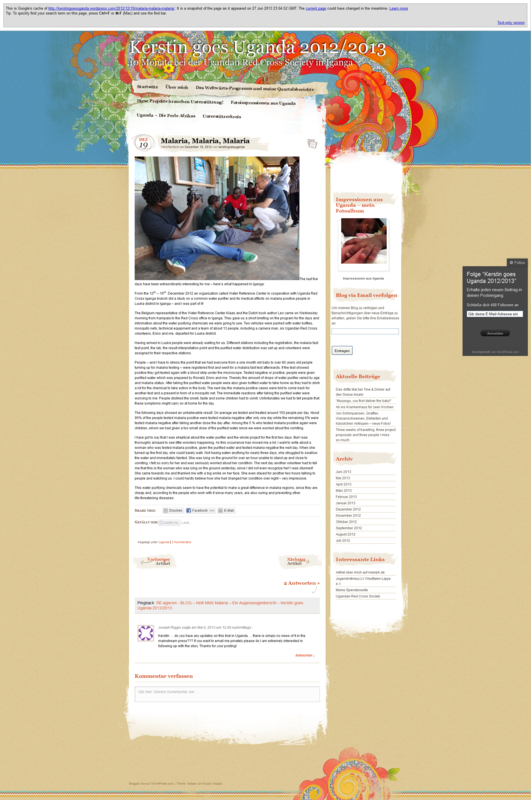 Malaria_Malaria_Malaria_-_Kerstin_goes_Uganda_2012-2013.png PNG 1869x2816 5.1MB Screenshot of blog entry about MMS Red Cross Malaria Test, that was subsequently deleted by the author for unknown reasons. Screenshot taken from this Google Cache Page, which may or may not still work.